Papaver somniferum, member of the Papaveraceae family, is the source of beauty, flavor and controversy throughout the world. Floridata.com states that poppies, grown for medicinal purposes including the narcotic opium for more than 6,000 years, originated in Europe and Asia. Grown as ornamental flowers, poppies reach 3 to 4 feet in height and produce a wide range of graceful blooms in red, white, purple, mauve and pink. Papaver somniferum seeds take two to four weeks to germinate, when they are planted in a location that offers average temperatures between 60 and 70 F, well-draining, nutrient rich soil with an average pH level of 7, full sunlight and light to moderate moisture. 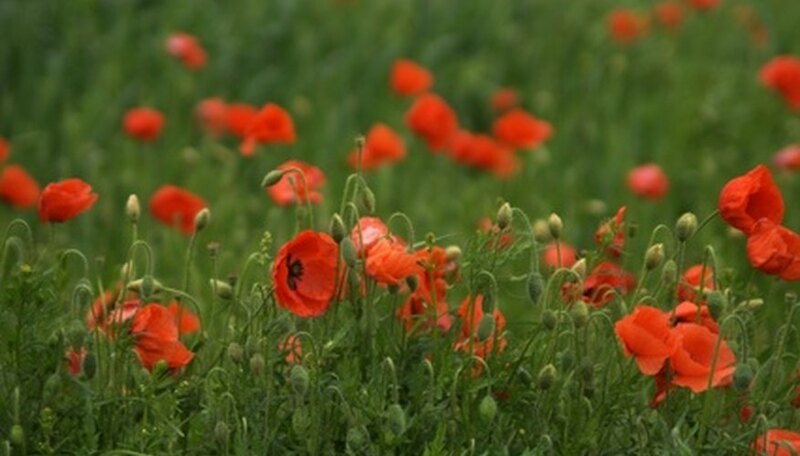 Poppies are highly sensitive to disruption; therefore, choose a permanent location in which to sow seeds for the best success rate. After the seeds have germinated, foliage appears above the soil line in the form of a basal rosette of curly leaves. Poppies produce one to three main stems, which shoot up from the center of the basal rosette within two to three weeks of sprouting. Each stem sports frilly foliage and ends with a single bud which bends, or nods, over until it is ready to bloom. Papaver somniferums typically bloom within two to three months after germination. Depending on the variety, blooms may be single, double, or shaped like pom poms. Once the poppy blooms, each flowers lasts 30 to 40 hours, then falls away to reveal the growing seed pod. The pod is the most controversial, illegal, part of the poppy. Pods can be globular, elongated or oblate in shape, and produce the milky white latex from which opium is produced. According to Poppies.org, opium can be harvested from seed pods in as little as two weeks after the blooms fade. Opium production is a painstaking, rigorous procedure that is illegal in many parts of the world. Poppy seeds are a popular addition to salad dressings, cakes and muffins. When the seed pod is allowed to ripen and dry on the stem, it produces thousands of seeds. Papaver somniferum plants are self seeding. The seed can be collected and stored indefinitely for further propagation.